Copywork models include interesting facts about leaders, kings, the church, the Magna Carta, cathedrals, priests, monks, St. Benedict, St. Francis of Assisi, nuns, feudalism, nobles, clergy, peasants, barons, bishops, lords, knights, jousts, armor, castles, manors, houses, villages, festivals, fairs, feast days, drama, guilds, merchants, food, the Plague, Joan of Arc, Gutenberg, and more. 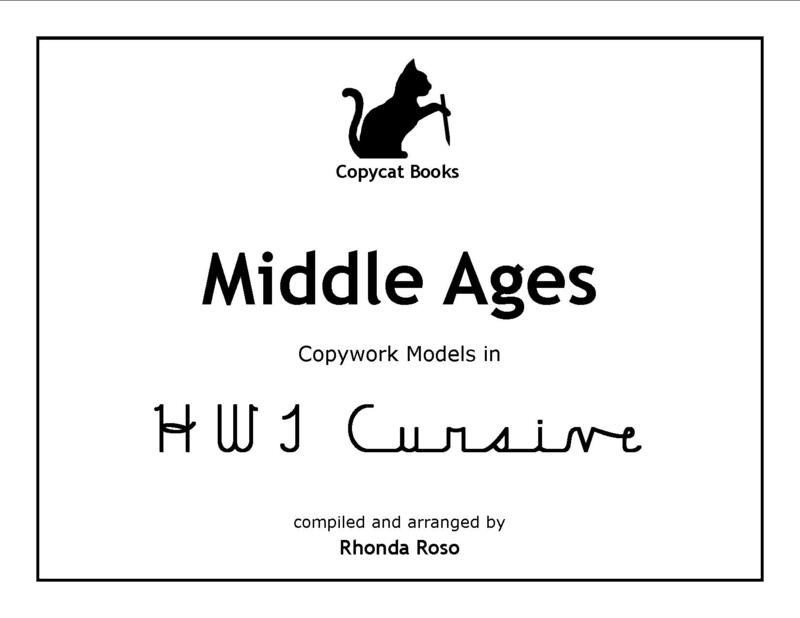 E-book (downloadable PDF file) with copywork models in your choice of Traditional, Modern, Italic and HWT cursive handwriting styles. Ample lined writing space provided directly underneath each line of the model. 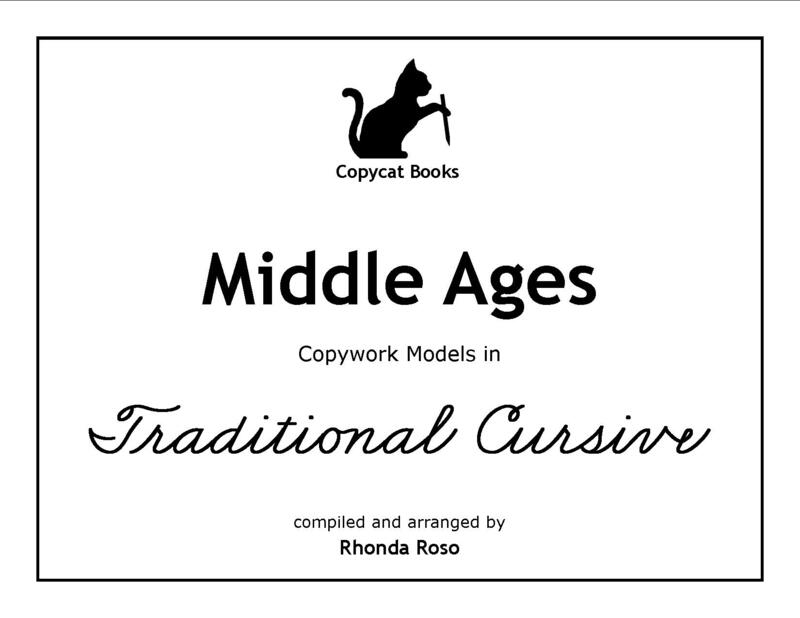 Includes easy to follow, step-by-step instructions for a typical copywork lesson and optional dictation lessons, as well as practice pages for upper and lower case alphabets and numerals. Designed for grades 3 and up. 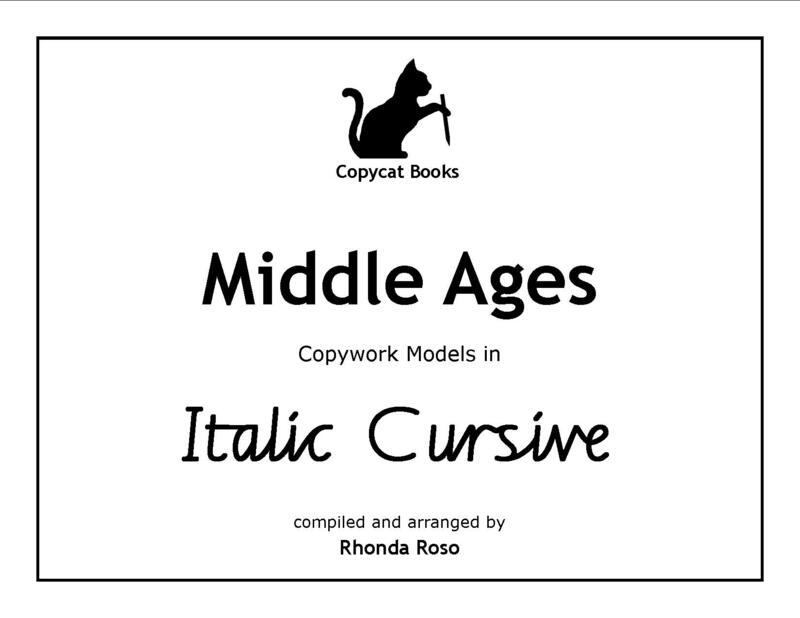 Students will benefit most from this Italic Cursive e-book that have completed instruction from Book C and/or Book D of the Getty-Dubay Italic Handwriting Series. This e-book provides lined writing space with 6mm body height which corresponds to the line size used in Books C through F of the Getty-Dubay Italic Handwriting Series, as well as that of wide-ruled notebook paper. Please note: Copycat Books are NOT printed books. Copycat Books are downloadable PDF files (e-books). View sample pages below using Adobe Reader.